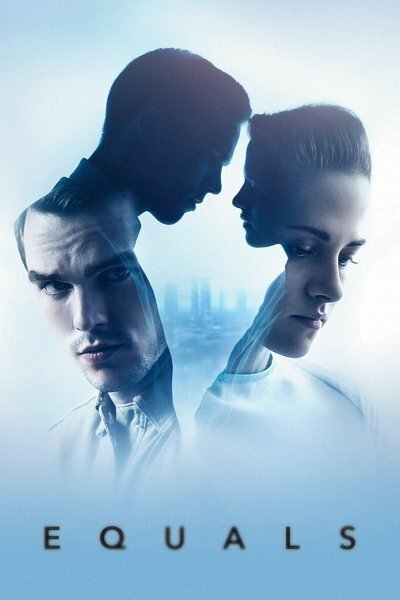 The first thing you need to know about "Equals" is that it's set in a world depopulated by war, where the open display of emotion is forbidden and romantic love is a crime. Your reaction to that summary will probably determine whether you can give yourself over to this film—well, that or your interest in Kristen Stewart, who plays one half of a couple that falls in love anyway, damn the consequences. Stewart had a rough go of things early on in her career, making a lot of money starring in the "Twilight" films but also being slammed as an unconvincing actress who came across as wooden when called upon to project big, melodramatic feelings. With a bit of distance from that series, we can see that Stewart was doing heroic work in a part that didn't naturally suit her. She's a very subtle actress who excels at roles that keep the audience at some remove, suggesting a character's interior state with measured gestures and expressions. Michelangelo Antonioni would have known how to use her, and there are many moments when the director of this movie, Drake Doremus—a specialist in romantic melodramas—displays an uncanny understanding of what she can bring to a film. Stewart plays Nia, a writer who works at a company that extols the virtues of space exploration in a post-apocalyptic society. She falls in love with the film's main character, Silas (Nicholas Hoult), an illustrator who becomes smitten with her almost immediately but can't do anything about it because she doesn't want to be oppressed and then ultimately put to death. Anyone who shows emotion is diagnosed with "S.O.S." (an acronym for Switched-On Syndrome) and medicated with lobotomizing drugs until the feelings go away. If the feelings don't go away, the smitten person gets shipped to a "Den" where they're encouraged to waste away or kill themselves. The world of "Equals" recalls the history of the planet Vulcan as presented in the "Star Trek" universe. The Vulcans were a passionate, violent people that nearly wiped themselves out through war, then reconfigured their society to suppress emotions. The film's opening section reveals that Nia and Silas' world lost most of its population and livable land to war. The remnants have cordoned themselves off from the more unruly humans who live in the ruins of a nearby city. They're all so cool that they sound heavily medicated when they speak. They're a society of snitches, instantly reporting any anomalous behavior to authorities. That the film is as much in love with Stewart as its hero is in love with Stewart's character makes "Equals" a rare movie that syncs up with its leading lady's strengths. The problem isn't Stewart, it's almost everything else. This is a heartfelt film, often brilliantly directed, but quite thin in terms of vision. "Equals" is what I call "jumpsuit science fiction," not because everyone in it wears a jumpsuit (they wear white suits with jackets and trousers here) but because the movie worships the sort of 1970s future-vision showcased in films like "THX 1138," "Logan's Run" and "Star Trek: The Motion Picture." Everything is sparsely decorated, with big windows and lots of open space, slick floors and walls, rooms that roll out of wall compartments in response to verbal commands, and oversized computer screens with data blinking and scrolling. This is one of two major modes for mainstream science fiction films, the other being a vision of dystopia where raggedly dressed people with bad teeth cackle over burning trash cans. When there are honest-to-goodness ideas on display in either type of film, the production design cliches don't do much damage, and can be fun to watch. There are many thoughtful or amusing touches in "Equals," especially its portrait of love advocates who suffer in silence and occasionally trade war stories in support groups (one of them is Guy Pearce, characteristically excellent as a "been there, buddy" advisor to the hero). But there are no ideas to speak of in this movie. It's mainly a poster tagline filled out with characters and scenes: "In a world where love is forbidden, these two can't keep their hands off each other." "Equals" is unabashedly pro-emotion and pro-love, which is...great? I mean, yes, sure, that sentiment is great, or at least necessary, because otherwise the species would've died out a long time ago. But I don't know anyone who would argue with it, do you? Does love require a full-throated defense? Who is anti-love? Maybe it's best to look at "Equals" as a clever way of getting around the biggest obstacle facing most modern Western love stories, which is: how to restore the tingle of forbidden attraction when nearly everyone going into a film thinks of themselves as too enlightened to be daunted by the obstacles presented by the movie they paid to see? Most viewers no longer accept race, nationality, class or religion as barriers to true love, so how can a storyteller make attraction feel exquisitely forbidden again? "Equals" goes for the Vulcan solution, and while the movie feels a bit light and padded as a feature, it believes in itself completely, and there are moments when the sincerity of the lead actors and the director's addiction to the narcotics of Kristen Stewart's eyes, lips, neck and hands puts the concept over the top. Doremus, who directed the likewise slight-but-appealing "Like Crazy"—about a British exchange student (Felicity Jones) who falls for an American student (Anton Yeltsin) whose visa is about to expire—photographs Hoult and Stewart as if they were lovers in a Wong Kar-Wai movie: silhouetting them against windows and video screens, watching them as they surreptitiously look at each other, at times cropping parts of their bodies in closeup so that they become slightly abstract sculptural objects. There are a couple of sexual encounters here that have real heat; as in a Hollywood film from the late sixties, when censorship standards had been relaxed but there wasn't a ratings board yet, Doremus has mastered the art of being explicit without actually showing you anything. There's a moment midway through the film where Silas and Kia pass each other in their workspace, and the movie focuses on their hands as they pass each other; their hands almost touch, but not quite, and it's such a close encounter that you can feel the energy between them. If anyone asks me what this film is about, I'll mention that moment, and save the backstory for later.